Ideally a solar thermal water heater would be extremely robust and effective in variable daily conditions. It would give a straightforward, predictable output. A couple of recent innovations have produced some very effective, deceptively simple designs that are pushing the boundaries of prior developments. One I look at under another section on generating solar thermal energy. The other is an inventive model delivering major benefits in situations that would have seemed incompatible with such arrays in the past. It had its beginning in the late 1970s oil shock in an industry that required large volumes of hot water. As the price of oil-generated water heating went through the roof, other methods needed to be found. Initially seeking to use coal, Shimon Klier as the principal shareholder and CEO of Argaman Industries Ltd, one of Europe's largest textile factories, began exploring solar thermal generation ideas to supply industrial amounts of water heating. Establishing Arel Energy Systems, he worked with European Union developers to improve on his initial idea. As the price of oil fell again, the appeal and cost effectiveness of developing solar thermal water heating disappeared. 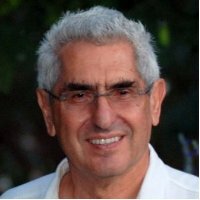 In 1995 Shimon had moved on as a co-founder of Imarad Imaging Systems. By 2000 the solar thermal water heater developments had more or less stopped. It was not until 2007, with further rising oil prices, that he began re-exploring his original research. TIGI solar was born, continuing development to this day. Essentially a flat panel solar thermal water heater the TIGI solar system has some unique effective elements. 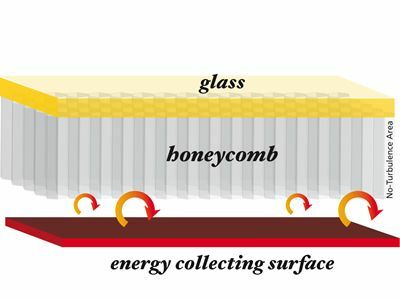 The surface under the glass covering has been constructed from a transparent polymer in a honeycomb pattern. This allows the transmission of solar light energy to the active plate below. It also provides a very robust structure capable of resisting damage from environmental hazards such as hail. 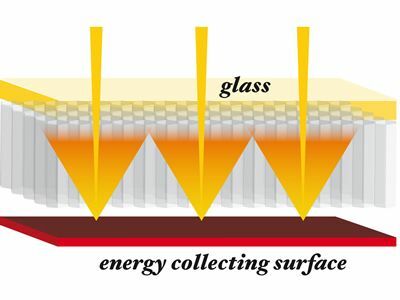 At the same time it prevents the establishment of thermal convection currents within the apparatus which would allow loss of heat at the glass surface. 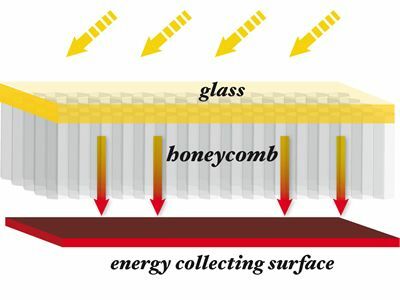 Independently the honeycomb polymer also prevents infra-red energy radiating back to the glass surface. Both these benefits significantly raise efficiency. A built in overheating protection device has been developed exclusive to the TIGI Solar water heating panel. With all these improved efficiencies the unit will generate an effective heating output on hazy and indirect sunlight conditions. 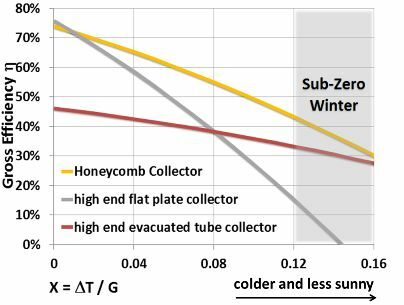 Snow covering the panel will not prevent heat generation. The insulating qualities allow for excellent performance even in sub-zero winter conditions as occur in northern Europe and North America. The relatively simple design allows for decades of production without concerns like gradual loss of vacuum in evacuated collector designs. Testing in real world conditions of winter months in northern Europe has produced results of 750kWh/m2 annual yield. The unit's effective collector size is 1.88 square metres from a constructed 2.09 square metres. 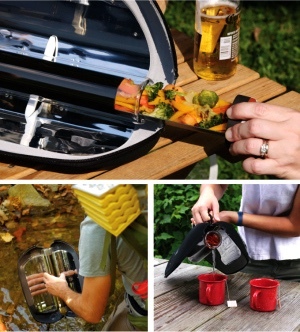 Each unit can heat water effectively at up to 120 litres (30 US gallons) an hour. Until now, as with other newer solar thermal water heater designs, the company has been aiming more at commercial and industrial applications. They have produced a financing package to ease barriers produced by up-front costs of the units. 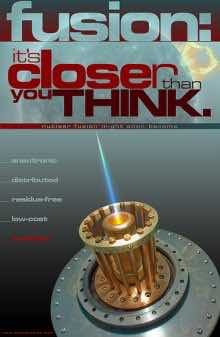 Commitment to commercial and industrial applications makes sense on at least a couple of counts. Businesses will usually require multiple units. Daytime is solar energy delivery time. And industries tend to be daylight-time consumers of hot water, whether directly used or for space heating and cooling of buildings. Home use of water from a solar thermal water heater tends to be in the early morning and evening. With this timing, frequently domestic hot water gets heated more by the supplementary power source, whether electricity or gas. Savings benefits will take even longer to show. Having a double tank or thermocline water cylinder could make this timing issue less of a problem. If you then need to dispose of your old hot water cylinder Sally at Think Tank Home has written an interesting and thorough article about what you can do with it. Whether it's past its use by date, or has more life in it. Check it out! Certainly, with the versatility of the TIGI solar thermal water heater unit, there will be many areas of the world this fascinating design will prove effective for delivering commercial and industrial water heating, as well as space heating and cooling applications. With its simplicity and rugged design I am interested in it as a source for my future domestic water heating. Especially if it can be paired with an effective water heating cylinder design.